It was boasted that more than 10,000 tickets were sold in advance of Scarlets v Ospreys' West Wales derby at Parc y Scarlets today. And while it is certainly no proof of a game in rude health, they are encouraging signs. Around the same time as the West Walian faithful are exiting the Llanelli ground, a figure somewhere north of 46,000 will be pouring into the Aviva Stadium. Leinster v Munster is special and still very precious to Irish rugby. Leinster were always considered the pretty-boy province, playing the flashiest brand of adventurous rugby. I say that as a Dub born and bred and a one-time product of the system. Strangely, it was Michael Cheika who made the greatest impact in changing the nuts and bolts from within. Joe Schmidt tapped into that transition and took the combined package to a new level. The bottom line and greatest strength sees Leinster as close now as they have yet been to the complete article. Ironically, the greatest collective asset on the back of that evolution is not physical but psychological. In a bind you would back them to find a way out almost every time. Look to the Cardiff and Connacht games on the road this season. There were different demands on less than domineering days and still they managed to find that way out. That is some achievement and some strength to have in the locker of the individual and collective mind. They are not the complete article but in an Irish context, irrespective of the result today, they are some distance ahead of the rest. The term weakness is relative. The system is such that a conveyor belt of talent continues to emerge. Look no further than John Cooney, Jordi Murphy, Andrew Conway and Joey Carbery to underline the obvious. That said, and somewhat ironic given that Carbery - in search of game-time - was one of those forced to leave, but I do have concerns over the out-half position. Ross Byrne is a very talented footballer and close to the Johnny Sexton mould in so many ways. On that basis it was easy to see why Byrne would fill the Sexton void more smoothly than Carbery on a like-for-like basis. I still deem Ian Madigan another significant loss. For now, the 10 jury is still out. It might not apply in its totality today but from next week and the first series of Heineken Champions Cup games, the quality from No 1 to 23, and specifically the game-changing impact or the ability to seal any game after the hour mark makes Leinster the powerhouse they now are. 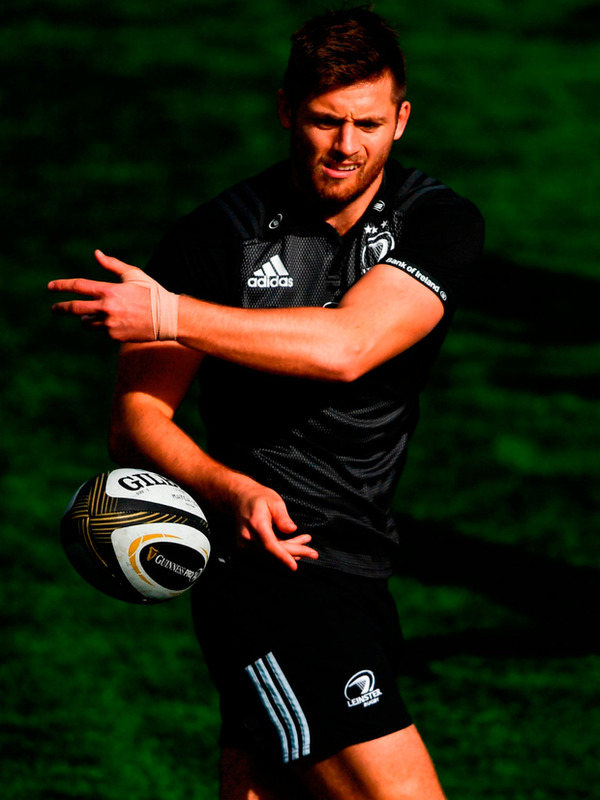 How demoralising for Munster will it be to see Cian Healy and Andrew Porter replace Jack McGrath and Michael Bent today, or what about Josh van der Flier, Sean Cronin and Luke McGrath who are among Leo Cullen's other bench options this evening. The mind boggles. In terms of scrum-half, also watch for Hugh O'Sullivan and Patrick Patterson down the line, who were great rivals in their school-going time at Belvedere and Blackrock respectively and are now competing for that pivotal slot on the Leinster 'A' team. And brace yourself because there's a whole host of underage talent coming after that. With respect to the rest this highlights Leinster's rise and rise for me. Under Michael Dawson's watch what has evolved, and way ahead of the other three, is a coaching system from within. Yes, it has taken some of the best of southern hemisphere coaching nous to get to this point but I love the Anfield 'boot-room' feel to Belfield in more recent times. I also love the way the head coach, arguably the province's greatest captain of all time, goes about his rugby business. He delegates, trusts and carries out media duties with the type of dignity befitting the post. Whatever makes Jose Mourinho tick, Cullen is the polar opposite. As for the addition of Stuart Lancaster and more recently Felipe Contepomi and Hugh Hogan, alongside John Fogarty, suffice to say if there is a better coaching balance anywhere then I don't know it. What Cullen and Lancaster, in particular, have done is to build on the Cheika/Schmidt era and despite the Matt O'Connor glitch it has been almost seamless in its execution. IT'S hard to define that much-abused term but in my lexicon it marks the magic-makers - those players with the instinct and natural ability to deliver the unexpected when it is most needed. It is easy to do for those so gifted on sunshine days when the wind is blowing a gale from the back, but when the chips are down the best of those so blessed with the inventive ingredient are prepared at any given opportunity to take that chance. In order, Jordan Larmour, James Lowe and Garry Ringrose possess the X-factor. The skill-sets differ but the moral courage is shared equally. I love Larmour's dancing at pace, Lowe's uninhibited offloads and the all-round Ringrose game. Heady times indeed.